A Pai, B Nayak, A Kini. 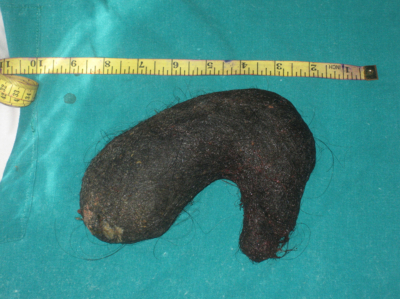 A Rare Case Of Trichobezoar: The Rapunzel Syndrome. The Internet Journal of Surgery. 2012 Volume 28 Number 2. A bezoar is a tightly packed collection of undigested material that is unable to exit the stomach. Most bezoars are of indigestible organic matter such as hair – trichobezoars – or vegetable and fruit – phytobezoars – or a combination of both, but other rare substances have also been described in the literature. Here we describe one such case seen in a young girl where the trichobezoar had taken the shape of the stomach. A bezoar is a tightly packed collection of undigested material that is unable to exit the stomach. Most bezoars are of indigestible organic matter such as hair (trichobezoars) or vegetable and fruit (phytobezoars) or a combination of both, but other rare substances have also been described in literature. Trichobezoars commonly occur in patients with psychiatric disturbances who chew and swallow their own hair. Only 50% will have a history of trichophagia. Trichobezoars have been described in literature and they comprise 55% of all bezoars. In very rare cases (Rapunzel Syndrome), hair extends through the pylorus into the small bowel causing symptoms and signs of partial or complete gastric outlet obstruction . A 17-year-old girl was admitted in the Surgical Unit C of Govt. Wenlock Hospital, with a history of abdominal pain, distension, weight loss and attacks of vomiting which was not persistent but came after meals and fluid intake. This happened on and off for almost one year. She was treated in different primary health care institutions as a case of gastroenteritis and parasitic infestation. Despite the treatment she was receiving, there was no improvement in her condition; in fact she was getting worse. In the outpatient department, abdominal palpation revealed an oblong mobile well-defined mass occupying the upper half of the abdomen, the mass was not tender and was firm in consistency. Upper gastrointestinal endoscopy revealed a Trichobezoar occupying almost the whole gastric cavity, an attempt to remove it by foreign body forceps failed and the forceps was barely pulling few fibres of this huge ball of hair. Figure 3. 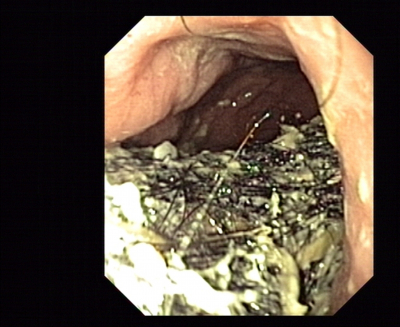 Upper GI endoscopy showing the trichobezoar in the stomach. The patient was operated, and through upper mid-line incision the stomach was opened (gastrotomy) between two Vicryl stay sutures. A huge trichobezoar was identified which had the shape of the stomach. There was a long tail of hair extending through the pylorus into the small bowel. By this feature the diagnosis of a Rapunzel syndrome was clear. The opening in the gastric wall was closed with a continuous Vicryl suture. The patient had an uneventful postoperative course and was discharged after ten days. The parents were advised to visit psychiatry for follow-up. The common presentation of trichobezoar is in young females, usually with an underlying psychiatric disorder. In our case, the presentation is in a very young age with hair extending down to the small bowel, causing symptoms which could mimic gastrointestinal infections and infestation especially in endemic areas. Rapunzel Syndrome is a rare form of trichobezoar. It is named after a tale written in 1812 by the Brothers Grimm about a young maiden, Rapunzel, with long hair who lowered her hair to the ground from a castle, which was a prison tower to permit her young prince to climb up to her window and rescue her. In recent years more and more cases have been described . This syndrome was originally described by Vaughan et al. in 1968 . The commonly accepted definition is that of a gastric trichobezoar with a tail extending to the jejunum, ileum or the ileocecal junction. The majority of cases of trichobezoar present late, due to the low index of suspicion by the physician. Of 131 collected cases of trichobezoar, a palpable abdominal mass was present in 87.7%, abdominal pain in 70.2%, nausea and vomiting in 64.9%, weakness and weight loss in 38.1%, constipation or diarrhoea in 32% and haematemesis in 6.1%. The laboratory investigations revealed low haemoglobin in about 62% (average) . The complications of Rapunzel syndrome range from attacks of incomplete pyloric obstruction or complete obstruction of the bowel to perforation, peritonitis and mortality [5-7]. Of patients with trichotillomania (a psychological condition that involves strong urges to pull hair), around 30% will engage in trichophagia, and of these, only 1% will go on to eat their hair to the extent requiring surgical removal . Less than half of the patients give a history of trichophagia. There have been few cases of recurrence following successful surgery . Endoscopy is diagnostic in almost all cases, while ultrasound has not much to offer as a diagnostic tool. CT scan with contrast will delineate the extension of a trichobezoar. In the early stages, endoscopic removal is not without risk of bowel perforation and should be reserved for small trichobezoars only . Other methods including the use of laser ignited mini-explosive technique were used successfully . Laparoscopy has been also used with limited success. Open surgery still remains the corner stone of large trichobezoar removal, especially if it has an extension into the bowel, which might be missed with other methods of treatment. With a long history of a gastrointestinal problem in the pediatric age group with history of trichophagia, early endoscopy is recommended. All patients with trichobezoar should be referred for psychiatric evaluation after surgery to avoid recurrence. 1. 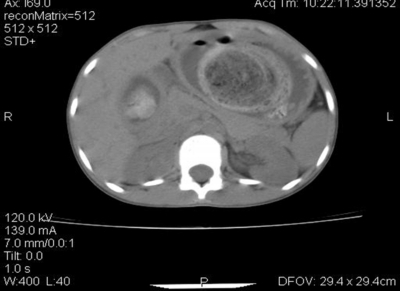 Phillips MR, Zaheer S, Drugas GT: Gastric trichobezoar: case report and literature review. Mayo Clin Proc; 1998; 73: 653-6. 2. Al-Wadan AliH, Al-Absi Mohamed, Al-Saadi AzanS, Abdoulgafour Mohamed: Rapunzel syndrome. Saudi Med J; 2006; 27(12): 1912-4. 3. Vaughan ED Jr, Sawyers JL, Scott HW Jr: The Rapunzel syndrome. 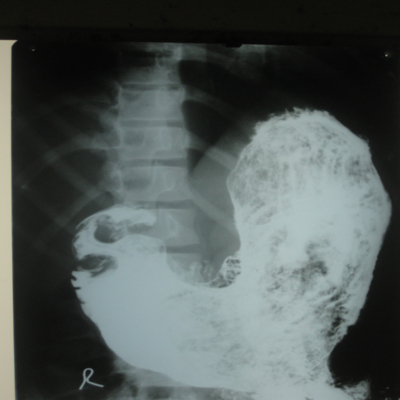 An unusual complication of intestinal bezoar. Surgery; 1968; 63: 339-343. 4. Naik S, Gupta V, Naik S, Rangole A, Chaudhary AK, Jain P, Sharma AK: Rapunzel syndrome reviewed and redefined. Dig Surg; 2007, 24: 157-61. 5. Mohite PN, Gohil AB, Wala HB, Vaza MA: Rapunzel syndrome complicated with gastric perforation diagnosed on operation table. J Gastrointest Surg; 2008; 12(12): 2240-2. 6. Ventura DE, Herbella FA, Schettini ST, Delmonte C: Rapunzel syndrome with a fatal outcome in a neglected child. J Pediatr Surg;2005, 40(10): 665-7. 8. Frey ArielS, Milissa McKee, King RobertA, Martin A: Hair Apparent: Rapunzel Syndrome. Am J Psychiatry; 2005; 162: 242-8. 9. Memon SA, Mandhan P, Qureshi JN, Shairani AJ: Recurrent Rapunzel syndrome – a case report. Med Sci Monit; 2003; 9(9): CS92-4. 10. Dumonceaux A, Michaud L, Bonnevalle M, Debeugny P, Gottard F, Turk D: Trichobezoar in children and adolescent. Arch Paediatr; 1998; 5: 996-9. 11. Huang YC, Liu QS, Guo ZH: The use of laser ignited mini-explosive technique in treating 100 cases of gastric bezoars. Chung Hua Nei Ko Tsa chih; 1994; 33: 172-4. Asst. Prof. of Surgery, KMC Mangalore , Manipal University.